Who likes marmalade? Paddington Bear and myself, for sure. You? 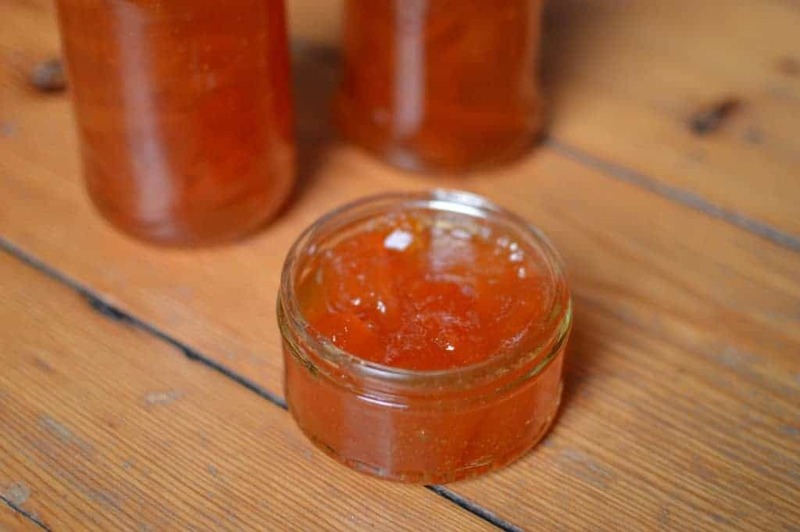 Well, you’re in luck, because this orange and grapefruit marmalade is delicious. After a big, loud and pretty sugary run up to Christmas, the start of the year has had a much calmer and almost homely feel here on TUS. 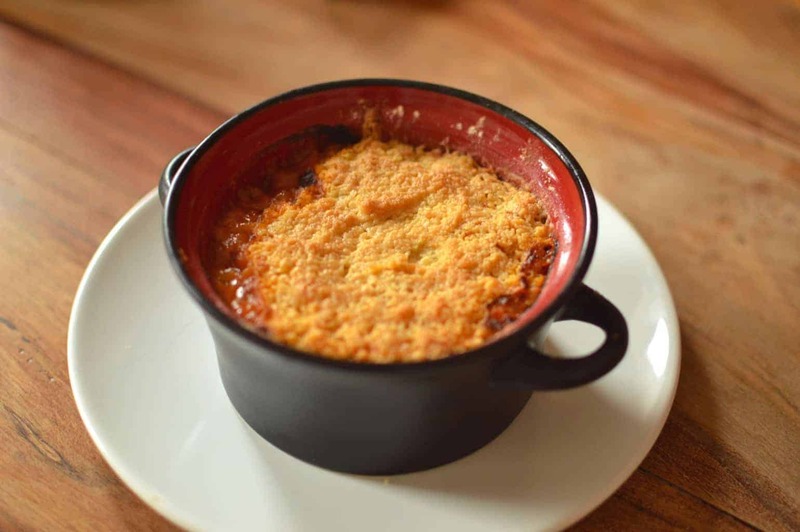 It’s a time of soup and more staple foods, like soda bread. 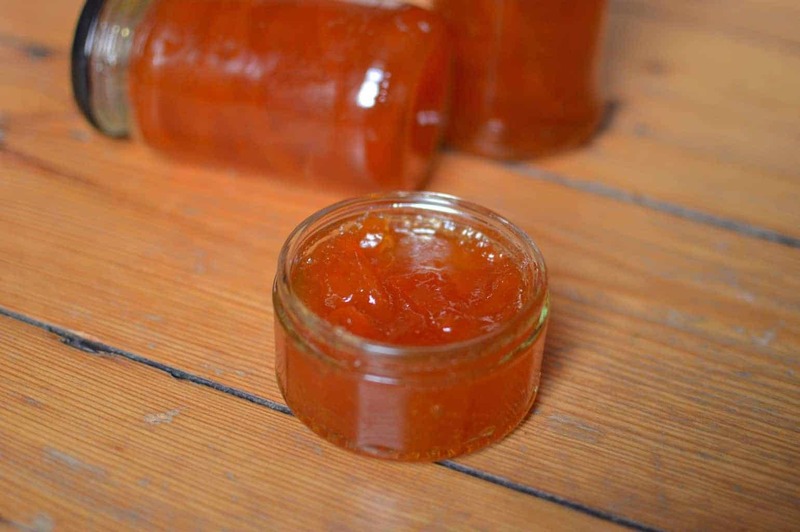 It’s also the perfect time for making marmalade. I love marmalade, and after using it a few times lately – in my marmalade glazed ham, and a delicious marmalade cheesecake after watching Paddington – but there’s nothing quite like home made marmalade, which is why I thought it was high time to make some more. Last time it involved some gin (because, I mean why wouldn’t it? ), this time round however, I enlisted the help of my friends whilst in the pub (where only good decisions are made, of course) to whittle my list of flavour options down to just one. And so it was decided that Seville Orange and Grapefruit Marmalade was going to be the creation of choice. Unlike the evidence in Paddington about Darkest Peru, Scotland doesn’t have native oranges, however since the Mediterranean has such gluts of them at this time of year I feel we’re justified in importing a few. And I also just really like marmalade (and if I wore a hat I would very much consider keeping an emergency marmalade sandwich under it). 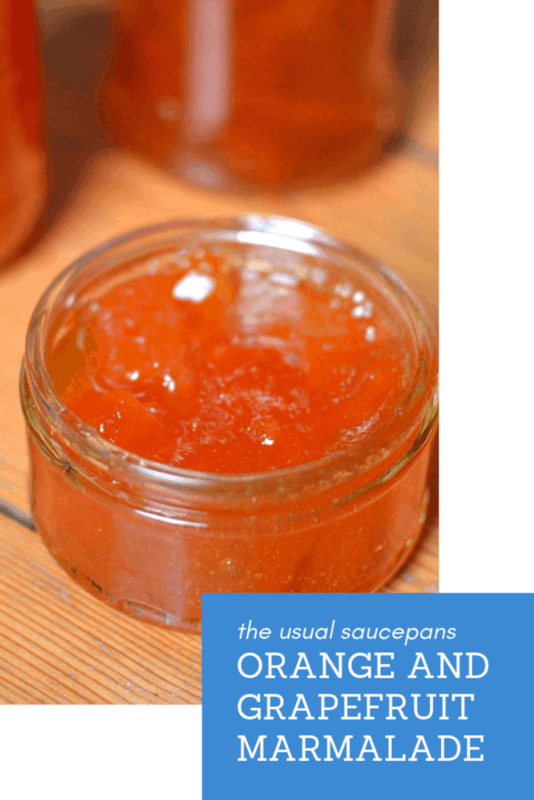 Whilst I’ve opted for oranges and grapefruit, marmalade can be made of virtually any kind of citrus fruit, so you can use this recipe for virtually any marmalade you like. Just remember though that they all have different levels of tartness – an orange is fairly sweet, whereas a lemon, well, just bite into one and you’ll see what I mean. Whether you are going to spread it on toast, make a cheesecake, eat it with a spoon or dissolve the last scrapings of the pan in hot water and drink it with a splash of gin (totally not what I’m drinking whilst writing this…) this marmalade recipe will give you a beautifully tart and sweet citrus hit, one which bears of all ages will enjoy, from those close to home all the way to Darkest Peru. 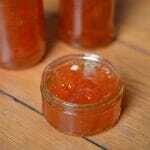 This recipe is adapted from my original Orange and Gin Marmalade, which itself is based on a BBC Food recipe. It makes enough for about 5 jars, which will last about as long as you can resist eating it all (not very long, in my case). Place a saucer in the fridge (it’s used to test the setting point, and needs to be cold). Take a large pan and put it on the hob on a high heat, add to this your 2 litres of water. Wash your oranges and grapefruit carefully under the cold tap (it should be unwaxed fruit you use). When the pan is boiling turn it down to a simmer and put the fruit in. Let it simmer away until the fruit is really soft – this will take between 10 and 20 minutes (roughly), depending on the size and ripeness of the fruit. Take them out of the pan and allow to cool, keep the poaching liquid. Chop each fruit in half, scoop out the flesh and put it in a sieve over a bowl. Remove the root of the stem (the little bit where the oranges were attached to the tree) and then slice. The thickness is up to you, based on how you like your marmalade, mine is probably a medium cut. 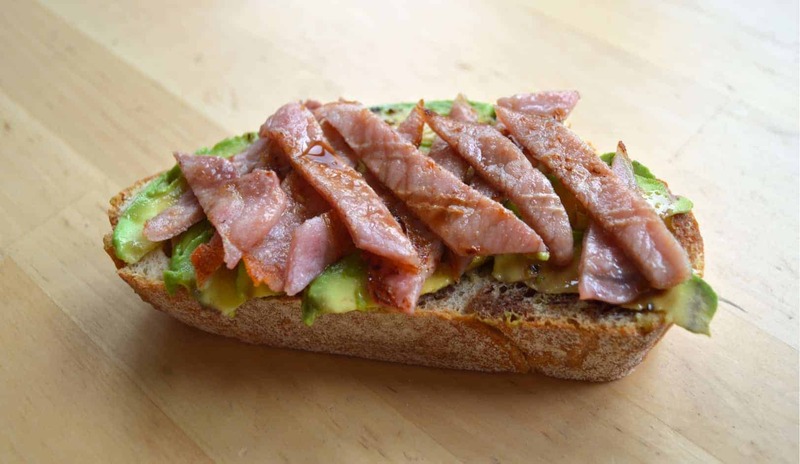 You may need to half some of your slices so they’re not too long when it comes to spreading them on your toast. Take about 500ml of the liquid out of the pan (so there is roughly 1.5 litres remaining) and then bring the pan back to a simmer. Add in about a third of the sugar, stirring to dissolve, then repeat twice more until all the sugar dissolves in the pan. Take your peels and return them to the pot. Pour in the juices from the bowl and add to the pot then place your sieve of citrus flesh over the pan. Mine went into the water by about 2-3cm, if yours doesn’t reach you can put it in a muslin bag or a very, very clean dish towel (that you don’t mind ruining). Stir everything together and turn up the heat so the pan starts reducing down. Let it bubble away (you need to watch it so that it doesn’t boil over) and let your kitchen slowly fill with a delicious aroma of oranges, grapefruit and hot sugar. If you are using the sieve method, lift it up and press the juices out a few times and only leave it over the top for about 10 minutes. Once it’s boiling wash your jars in hot soapy water, rinse thoroughly (no one likes soapy marmalade), then put in the oven at about 80 C to sterilise. Make sure to skim off any scum that comes to the top of the pan and remember to stir every so often to make sure the fruit is evenly distributed. The length of time it will take to boil down will vary between pans and volumes of water involved, but it should take somewhere between 25-40 minutes to reach the point where it feels much thicker as you’re stirring it. At this point take your saucer from the fridge and drop about a teaspoon (or so) worth of the mix onto the cold plate. Leave it for about 20 seconds and then run your finger through the middle. If the mixture wrinkles around your finger turn off the heat, if it remains runny leave to boil for another few minutes. Once ready, place your jars on a cooling rack beside the hob. 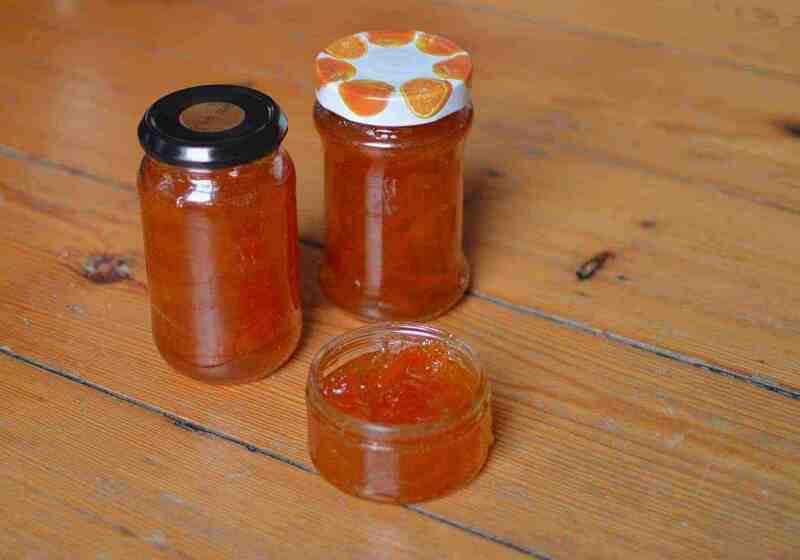 Hold the jar with an oven mitt or similar and using a large spoon carefully fill the jars with marmalade. Fill them virtually to the top and place a small circle of greaseproof paper in the top (get it ready-cut, I would say). Leave for ten minutes and then seal on the lids. When you’re filling the jars, use mitts – when filled with just-off the boil marmalade they’ll be very hot, take it from an idiot with burnt fingertips. 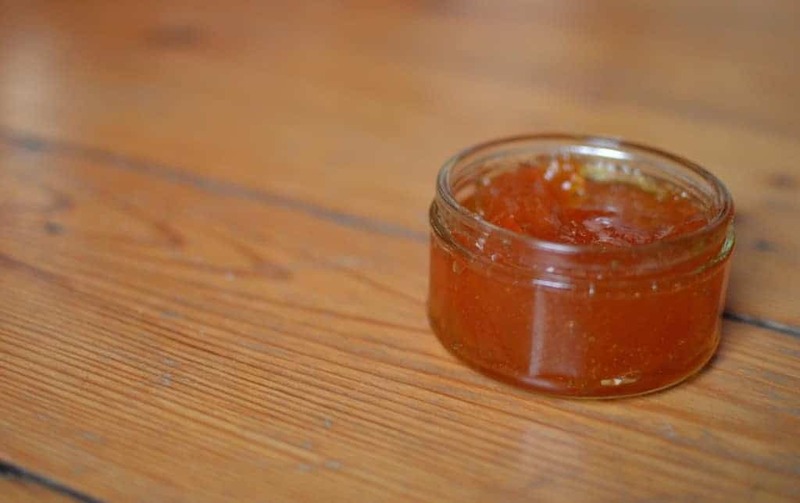 Thanks – I really loved the combination as well, makes for great marmalade!